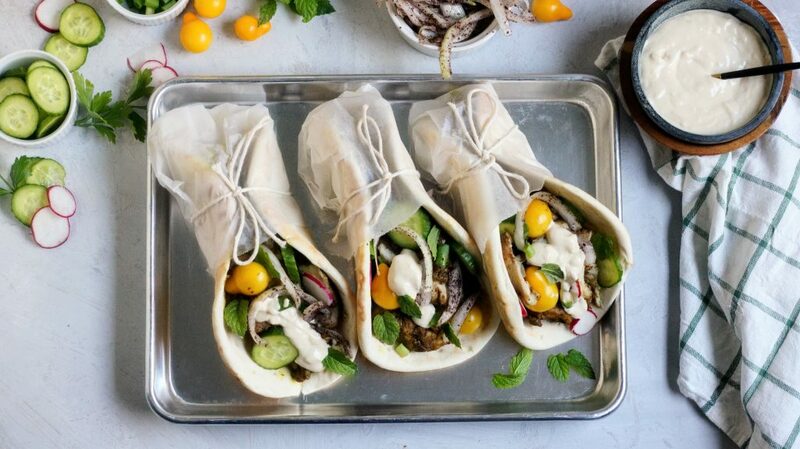 These delicious chicken shawarma wraps are quick, easy, healthy and perfect for any dinner. One of my fondest memories as a kid was my first trip to Lebanon. So many new people, places and things to see and do. I was about 12 years old and I remember my mom being terrified that after all the years of speaking to us in Arabic, we wouldn’t be able to hold a conversation. See, my parents always spoke to us in Arabic but we replied in English, go figure! To her surprise and delight, after a few days our mouth couldn’t stop talking. One afternoon our whole family, I’m talking My Big Fat Greek Wedding Style, 30+ people all gathered at a park or field or something for an afternoon. I’m sure I have pictures somewhere, but what I distinctly remember is watching my uncles and cousins butcher a lamb! I watched in intrigue and probably some horror as this little lamb was getting ready to be cooked. To the spit the little lamb went and I’m sure it was the best lamb I ever had!! 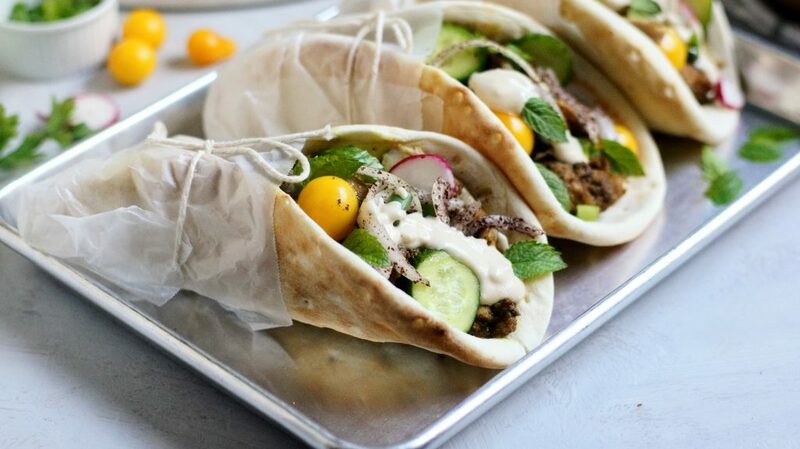 Shawarma is a meat preparation, historically done with lamb but today often with chicken, beef or veal. Much like my experience as a little girl watching the lamb cook on a spit, the shawarma technique was created to allow roasting layers and layers of meat but without bones. Meat is layered on a vertical spit and layered with fat to keep the meat tender and juicy. As the meat cooks, it is cut off to serve. The meat is flavorful, tender and delicious. Crazy as it may sound, shawarma was brought to Mexico by immigrants from the Middle East. Later they evolved into tacos al pastor. As Lebanese immigrants made their way to Mexico, they brought their culture and traditions. They began integrating their own heritage with Mexican cuisine. While I’d love to have a spit in my front yard, or a vertical shawarma roasting machine in my kitchen, that probably isn’t going to happen! So what’s the best way to get all the flavor in a shawarma sandwich? 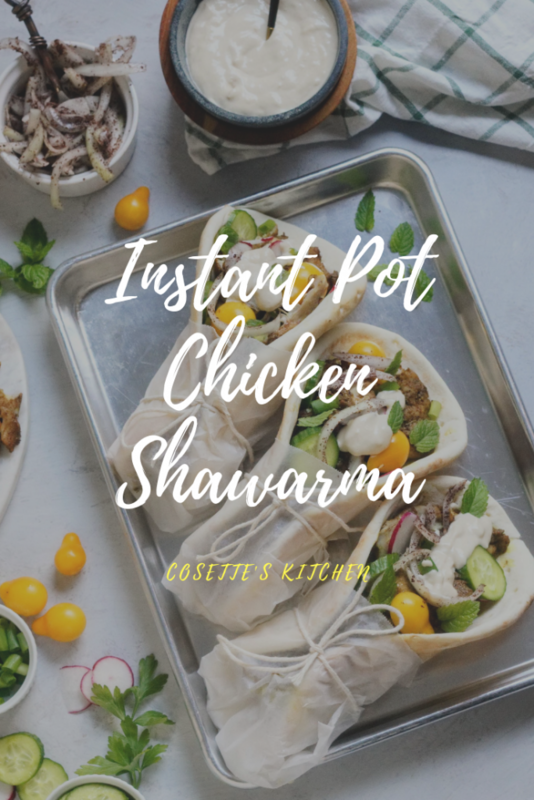 Enter Instant Pot! I’ve taken some of the oldest techniques and completely modernized them into using the Instant Pot. Spices, tender chicken thighs and all the amazing fixings, this sandwich may send you all the way back to Lebanon! I hope you enjoy this simple recipe, not only is this version delicious but the spice mix is divine and can used on anything from potatoes to burgers! As always, I love to see your creations be sure to tag me on Instagram or Facebook if you give this a try. 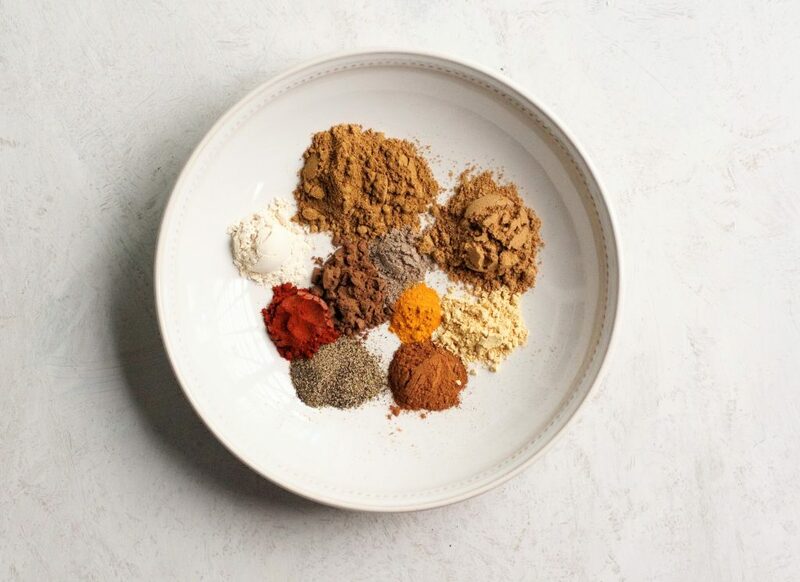 A gorgeous blend of spices to create a warm flavor. Chicken being prepared for the Instant Pot. Chicken cooked perfectly in 8 minutes! Wrapped up, filled with delicious veggies and tatatore sauce. Mix all spices together and store in jar. **Note the above Shawarma Spice Mix makes MORE than needed for this recipe. Save remainder for another time. 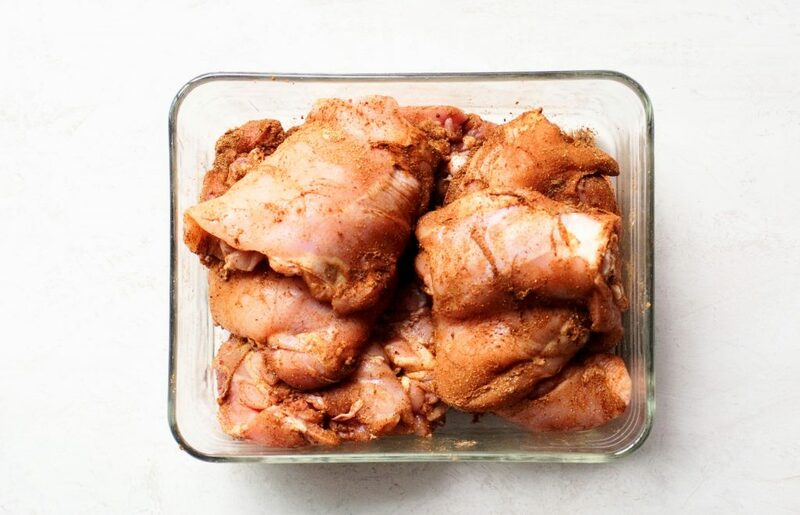 Coat chicken with 3 Tbsp Shawarma Spice Mix and olive oil. Can leave to marinade overnight, but not necessary. Add 3/4 cup stock to the bottom of your Instant Pot and add the rack. Lay the spiced chicken on the rack. Place lid on pot and close to sealing position. Set to MANUAL 8 minutes, let cook. Once completed, release pressure after 5 minutes. 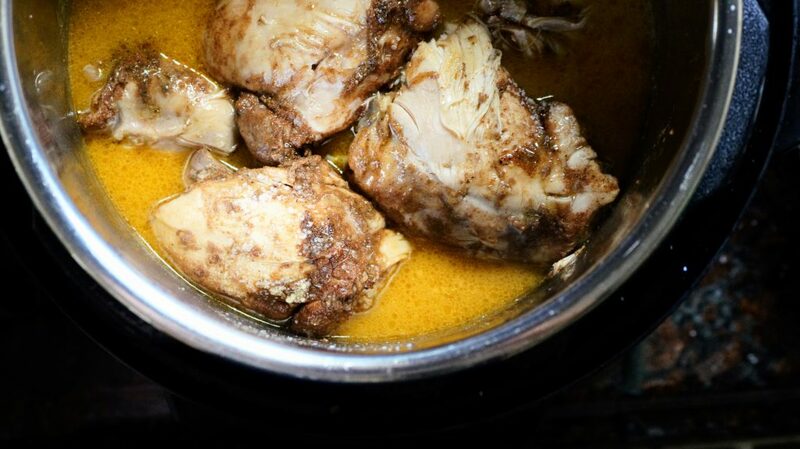 Prepare taratore sauce: With mortar and pestle smash garlic, add your tahini, water, lemon and salt. Adjust lemon and salt to your liking. Check out Episode 2 on Ugly Delicious for a deeper connection tacos al pastor and Lebanese immigration. Hi Cosette! This recipe sounds delicious. I’m going to make it this week. Question – In step 2 (Add 3/4 cup to the bottom of your Instant Pot and add the rack.) does the 3/4 cup refer to the spice mix? Sorry about the confusion, editing now. It 3/4 cup stock. 3 TBSP of the shawarma mix. Thank you! Hope you enjoy! That’s what I thought! I’ll save the 3/4 shawarma mix for the days I’m feeling super spicy. Thanks! Absolutely! Use the rest another time, you’ll only need 3 Tbsp for this recipe. I just kept the extra spice in a small mason jar with my other spices. ♥️ Enjoy!! Yay!!! So happy to hear Ingrid, let me know what you think. I made this tonight in the Instant Pot. It was delicious! Oh yay! So happy you tried it, so easy and versatile. Enjoy!